The vision of the Scarborough Waterfront Project is to create a system of green spaces along the Lake Ontario shoreline which respect and protect the significant natural and cultural features of the Bluffs, enhance the terrestrial and aquatic habitat, and provide a safe and enjoyable waterfront experience. 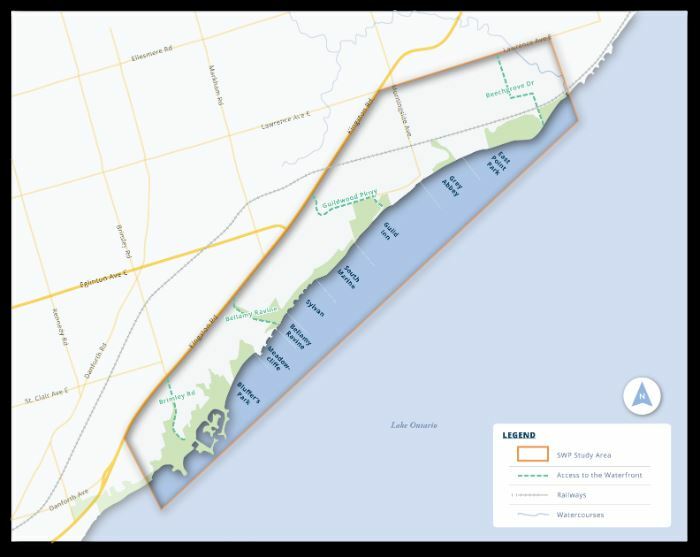 The study area extends across the shoreline from Bluffer's Park in the west to the mouth of the Highland Creek in the east. The northern boundary is Kingston Road and the southern boundary is Lake Ontario. View Study Area Maps. For more information about the Public Consultation process visit the Toronto and Region Conservation Authority website.